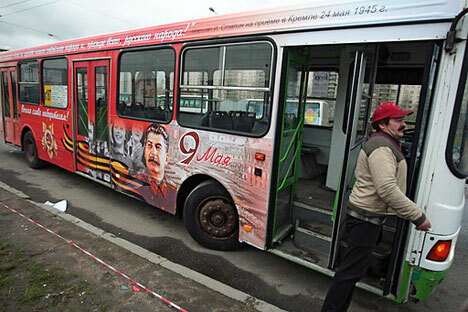 Buses bearing portraits of Joseph Stalin may appear in several Russian cities as the country prepares to celebrate the 66th anniversary of the defeat of Nazi Germany on May 9. The decision has been met with controversy by a society that remains deeply split over the role of the Soviet general secretary in the fate of the state. Meanwhile, Mosgortrans, a company operating transport in the capital, told Echo of Moscow radio station that they have nothing to do with the idea and there will be no Stalin portraits on their vehicles. Mikhail Fedotov, the head of the Presidential Council on Human Rights called the project a provocation, saying that it would only cause anger among the population. “We should not create yet another source of disagreements within the community. I am against such things,” he is cited as saying. Fedotov believes that federal authorities, such as Antimonopoly service should intervene in the situation. “Stalin is neither a product, nor a producer. Therefore it is purely a political advert, which is against the law,” he said. The majority of the population considers Stalin a bloody dictator whose mass political repressions in 1930s claimed millions of innocent people and turned the lives of others into a nightmare. However, many still believe that Stalin was not that evil and Russia owes its industrial development to him and praise him for the victory in WWII. According to a representative of the organizing committee of the “Victory Bus” action, Dmitry Lyskov, the role of the Soviet leader in the Great Patriotic War (as WWII is called in Russia) has been erased from history. The idea of placing Stalin portraits on commuter buses is aimed exactly at changing that situation, he told Echo of Moscow. Citizens of Omsk, Novosibirsk, Ufa, Volgograd, Kirov and Yuzhno-Sakhalinsk may be able to go for a ride on Stalin-buses. But whether they approve of the idea is a different question. In May last year, a bus with Stalin’s image started circulating through Russia’s Northern capital, St. Petersburg, sparking fierce criticism among human right activists. The same day the bus was launched, it was attacked by unidentified individuals who completely painted over the portrait. The “Victory Bus” action organizers state that the idea has nothing to do with politics and they do not intend to give any judgments to the Stalin epoch.A Novosibirsk committee representative, Vasily Manokhin told Siberian news website – tayga.info – that their gesture is history-related and only those who want to see politics in the campaign see it. The main task of the action, he said, is to withstand those who “erase history” and deny the past. “France remembers Napoleon, as he is part of their history. And Stalin is our history,” he said. Meanwhile, Communists’ leader Gennady Zyuganov slammed the so-called “De-Stalinization” plan – which is aimed at completely dismantling the cult of the former Soviet dictator – proposed by the Presidential Council on Human Rights. Zuyganov compared the project with the Dulles’ Plan, which is believed to have been developed during the Cold War in order to destroy the Soviet Union. "This was the idea put forward by [Allen] Dulles from the US Central Intelligence Agency, who formulated this concept back in 1945," the Communist leader told journalists on Friday, cites Interfax. Zyuganov believes that the Russian presidential council’s plan will only lead to conflicts between the peoples of the Commonwealth of Independent States (CIA), which unites 11 former Soviet Republics. Zyuganov was specifically disappointed that the plan was voiced on April 22, when Russian Communists celebrate the 141th anniversary since the birth of the revolutionary leader Vladimir Lenin. "I never thought that this idea would be pulled out from the Kremlin's human rights council on Lenin's birthday.They do not protect human rights, they cause disturbances and animosity in the country and all Soviet successors," Zyuganov said. All the former USSR people saw that they were drowning on their own “writhing in agony, as Dulles used to say." According to Zyuganov the idea was initially “born in the heads” of the Nazis, Fascists and other extremists. Three years ago it first “dragged into the Council of Europe three years ago only to see itself fail spectacularly." Hitting back at bitter criticism, one of the authors of the de-Stalinization plan and the chair of the human rights organization Memorial, Arseny Roginsky said Zyuganov’s words go against commonsense and historical truth. He noted that such a “hysterical” statement only demonstrates the weakness of modern Communist Party ideology. The human right activist believes that coming up with such “exotic” evaluations Communists simply attempt to keep their supporters. “[Communists are] accusing everyone of stirring up wars…reviving Stalin’s totalitarian myth about Russia being surrounded by enemies, a ‘fifth’ column inside the country. But, as we can see, modern Communists haven’t moved from Stalin and Stalinism,” Roginsky told Interfax.